If there is any filmmaker who can be said to be the heir apparent of the great Yasujiro Ozu, Kore-eda Hirokazu would be at the front of the line. Ozu was the master of Japanese family dramas, giving us masterpieces like Tokyo Story and Late Spring that demonstrated universally profound insight into the family dynamic. Through films like Still Walking (which examined adult children and their elderly parents) and I Wish (which explored the essence of childhood), Hirokazu has likewise proven himself extraordinarily adept at exploring what it means to be a family with tremendous grace and dignity. In his latest work Like Father, Like Son, Hirokazu examines not only the meaning of family, but the meaning of fatherhood, going even beyond the boundaries of familial ties. Masaharu Fukuyama as Ryota Nonomiya (Father) and Keita Nonomiya as Keita Ninomiya (Son) in Hirozaku Kore-Eda’s LIKE FATHER, LIKE SON. © 2013 FUJI TELEVISION NETWORK, INC./AMUSE INC./GAGA CORPORATION. All rights reserved. A Sundance Selects Release. The film centers around a seemingly implausible situation; two babies switched at birth in a mistake that isn't discovered until six years later. In the middle of everything is the Nonomiya family, whose father, Ryota, is a stern businessman driven by success and money. He pushes his son, Keita, to excel at the piano, practicing every day despite the child's disinterest and lack of aptitude. To Ryota, image is everything, and his son is a reflection of his own success. But when he discovers that Keita is actually the child of a lower middle class shopkeeper named Yukari Saiki, with a large family and much more lax standards of child rearing, his feelings toward Keita begin to change. Yukari's son, Ryusei, is undisciplined and active, whereas Keita is calm and reserved, each a reflection of the man who raised them. But now both families are faced with an impossible choice; do they exchange children to raise their own flesh and blood, or do they keep the children they have raised as their own for six years? 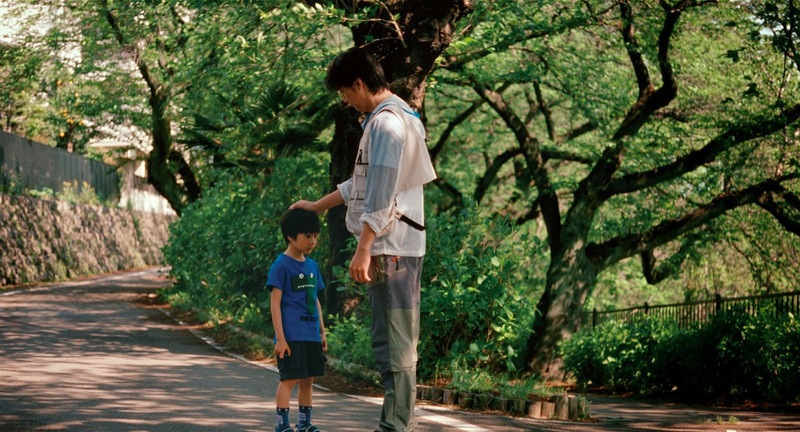 Masaharu Fukuyama as Ryota Nonomiya (Father) and Keita Nonomiya as Keita Ninomiya (Son) in Hirozaku Kore-Eda’s LIKE FATHER, LIKE SON. © 2013 FUJI TELEVISION NETWORK, INC./AMUSE INC./GAGA CORPORATION. All rights reserved. A Sundance Selects Release. It may seem like an impossible scenario, but it's also an ultimate "what would you do" question. The answer may seem simple to some, insanely difficult for others. And Hirokazu treats it with the intricacy and thoughtfulness it deserves. Family is about more than just blood ties, and in that regard Like Father, Like Son isn't just an ode to fatherhood, it's a loving tribute to adoptive families everywhere. Coming out of a society where so much importance is placed on blood lineage, this is a special film indeed. Like the very best of Ozu, Hirokazu never goes for obvious sentiment or sugary manipulation. Every note of Like Father, Like Son rings true. It's not a situation that demands an easy answer, and neither does the film. It builds to a quietly powerful climax, shattering in its simplicity and beautiful in its wisdom. This is a film that deftly explores that complexity and importance of fatherhood and family, and what that means in a world where families are frequently more than just the traditional two parent, mother/father model. In Hirokazu's world, there is room for all sorts, and it is a lesson that isn't without its price. It is, however, an essential one, and no one is better suited to tell this tale than Hirokazu, who directs with such delicacy that the result is something extraordinarily moving. No one can rend hearts quite as deftly as he can, and Like Father, Like Son is a keenly observed portrait of steadfast fatherhood and masculinity in a rapidly evolving world. 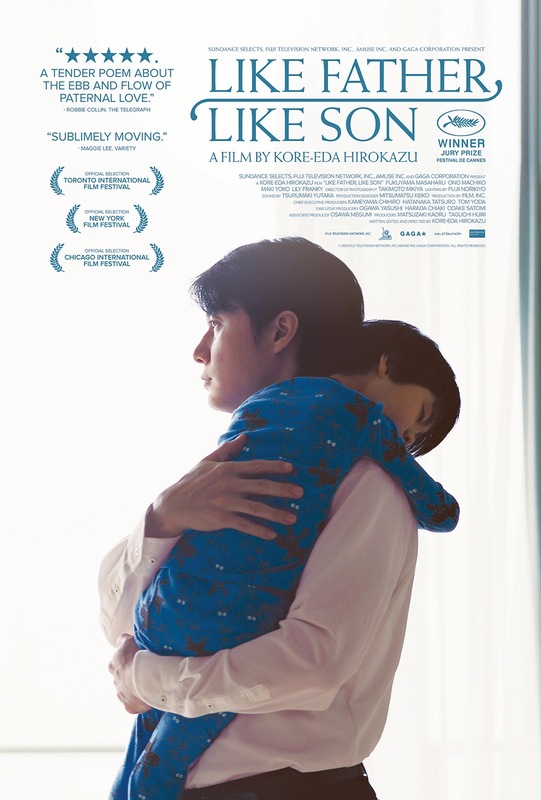 LIKE FATHER, LIKE SON | Directed by Kore-eda Hirokazu | Stars Masaharu Fukuyama, Machiko Ono, Yoko Maki, Riri Furanki, Keita Ninomiya, Shogen Hwang | Not rated | In Japanese w/English subtitles | Now playing in NYC. Another masterful work of art indeed.This is a really good movie to watch especially for young parents.